Disney’s latest project, “Coco,” perfectly cooks up a heartwarming story made signature by Pixar in their other made movies. This time, however, the narrative is perfectly intertwined with a personal adventure of self-discovery and strong familial ties. “Coco” cleverly ties in Mexico’s Day of the Dead holiday in an otherwise pretty straightforward hero’s journey. Not that it’s bad, in fact, it surprisingly works really well with the incorporation of music and stunning visuals. 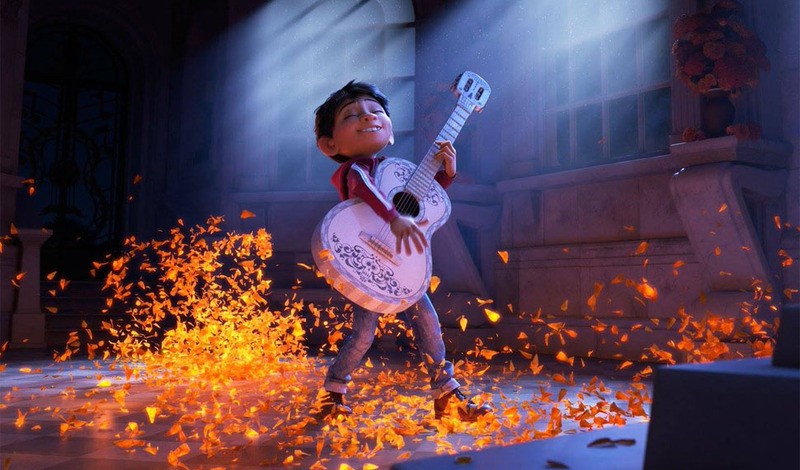 The movie follows wanna-be musician Miguel (voice of newcomer Anthony Gonzalez), who strives to follow the footsteps of his idol Ernesto de la Cruz (voice of Benjamin Bratt), an accomplished singer. Unfortunately, his family’s imposed generations-old ban on music hinders his dream, prompting him to sneak out his guitar sessions. His world is spun out of its axis, however, after he finds himself in the vibrant Land of the Dead following a mysterious chain of events. There, he becomes more motivated to prove his talent with the help of his newfound friend Hector (voice of Gael Garcia Bernal). By this time, no one really goes into a Pixar film not expecting to shed a tear or two. Over the years, the Disney subsidiary has been able to perfect the scheme of delivering heartwarming stories that caters not just to children but all demographics and “Coco” certainly follows heed with that tradition. First off, the movie is visually stunning, the graphics are majestic that you are easily immersed in the world that it is set in. While some were understandably skeptical about the incorporation of the skeletal manifestation of game players, it surprisingly handles it well that it is still kid-friendly and yet also interesting for older viewers. The backdrops are well-detailed made even better with the use of a wide spectrum of colors makes it look whimsical. Further, the film’s brilliant score and original songs add something to every scene, whether it’s an upbeat number or a an emotionally charged sequence. We always say that no movie is perfect, but “Coco” comes very close to that idea. It has a deep story enriched with Mexico’s culture and familial beats that does not alienate anyone. It tackles dreams and the question of what are you willing to give up to achieve those goals. Normally, inspirational movies like this is pretty much one-dimensional, only hammering us with the same message of not giving up over and over again. This movie, however, provides us with a different set of lens that could actually make as revisit our own stance when it comes to how far we are willing to go for our dreams. Despite the movie definitely having elements of mysticism and fantasy, its core story is very much rooted in reality, making it very relatable. The story is complex but not too much that kids could be lost in the narrative thread. “Coco” is peppered with heartwarming moments with Miguel and his family, not in a cheesy way, but in a way that mirrors our experiences with our own families. It puts a new spin on the idea of afterlife that teaches us that some ties are stronger than death and love transcends time and space. The mere fact that the film is being pushed for an Academy Award nod is a good indication that it’s well worth your time and money seeing it in cinemas. But even without all that Oscar buzz, like almost everything else that Pixar comes out with, be prepared to bring a box of Kleenex as the film is full of heart, it’s difficult not to well up. PS. If you’re a fan of “Frozen”, a short is attached to the film making “Coco” a definite must-see in theaters.